One final editing for Phase 1 of this epic project. Before I talk about this poem I wanted to recap a little of what this has all been about. 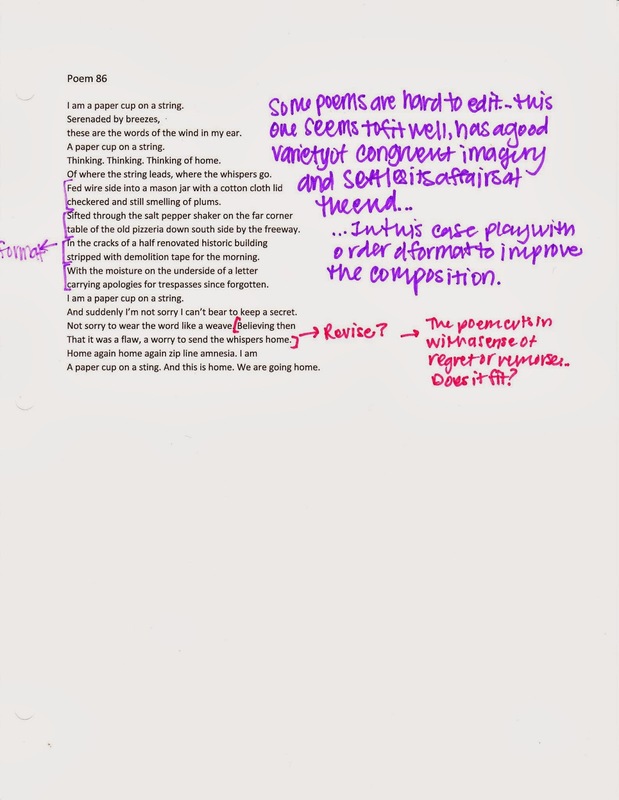 First, this beginning stage examined and revised all poetry that was not used in further projects (though those lines were a little blurry) and of course poems were excluded that exceeded 2 pages. It also stopped at a year from the project start to keep with the idea that it takes about a year. Many of these poems were vastly improved. Several of them were put down for later or forever and a choice few were completed as final drafts. Why bother? Because poetry is an art not a magic trick, and because art means a deeper understanding than just a fleeting moment of lyric greatness. Because at the end of the day this blog (que eye roll for the use of a blog with an art as old as poetry) will be the project, the collection will be the poem, and the final meaning of poetry itself will be more than any single poem could do. A name writ in water can be eternal, and it also can flow with the tides. With that I present Poem 86, an anomaly. I am always talk about the fabled perfect first draft. A poem that is so spot on that there needs no editing. I rarely get that poem, in fact there is only one other poem here that I feel that way about. The truth is, my work needs a lot of work. It’s always been that way, so when I stumble on one that needs little to no editing I am a little agape. Poem 86 is that poem. I was coming home from school to live for a while and I felt so strongly about the experience that I got it right on the first try. This may not be the best poem I’ve written, but as a first draft it is also as perfect as it will ever be. As a poet, that’s a hard call, but when you know you know. I made almost no changes and this ended up in the MFA selection, which proves how highly I regarded it. Of 100+ poems, I chose this first draft. Stay tuned for the next phases of this epic project. I hope you’re having as much fun as I am.